PEDI Protection de l'environnement et Developpement integres - Protection of the environment and of its related developments, registered in Bukavu in 2009, PEDI is a charity dealing with environmental issues relating to economically impoverished communities. Vital Kulimushi is the PEDI coordinator. 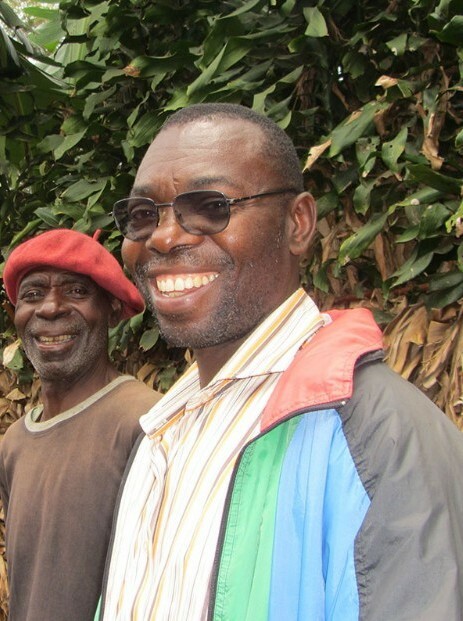 Vital has been a loyal supporter and worker for Congo Action for many years. Without his vital help many of the projects would have been less successful. Here is his story. Vital, born in 1963 in Bukavu, has spent his entire life studying and working in South Kivu. He has an impressive academic background. After finishing his secondary studies in Bukavu, Vital worked for two years as a Youth worker, followed by a one year computer studies during which time he also studied English. Discovering an interest in conservation Vital obtained a first degree at the Institut Superieur of Rural development, in Bukavu on the theme of the Conservation and bio-diversity of the Kahuzi-Biega National park. This was followed by a second degree, focusing again on the National Park of Kahuzi-Biega, but this time on developing a forestry and agro-forestry zone around the park. Vital works with a huge awareness of the necessity of conserving and respecting the environment and he works to share this passion with the communities with which he works. Besides his strong professional skills on conservation issues, Vital is also a teacher. In total he spent 12 years teaching first in a primary school (1986-1994), followed by one year working with orphan children in the harsh and perilous war zone of Goma (1995-1996). Vital's strongest interests and expertise lies in his work with rural communities, teaching his people about dealing with conflicts, living with the effects of many years of civil war and protecting and respecting the environment. He also organises working groups aiming to teach them to manage and share their resources. Congo Action started this programme in 2003, whereby children school fees were paid for by individual sponsors from the UK. For some time, Vital was responsible for administering the payments and reporting back to us. However, as we became more and more aware of the unfairness of this programme (in terms of selectivity), we changed it for a collective sponsorship of our school and its teachers. Vital was instrumental in introducing this change, and thanks to his tact and professional diplomacy, the parents took it well and accepted the change. Thanks to many of our original sponsors who have stayed with us, this programme is currently still running. In the villages of Cidjo and Bunkivane, Vital initiated a goat breeding project, working in partnership with a veterinary surgeon, who, aware of the damage that goats can do to the environment, trained the villagers to build stables in which to house their goats. This proved to be very successful with the offspring being passed on to group members on a rotating basis. Having a goat or two raises the family income and the profit is often used to pay for school fees. Here again, working within the community and the PEDI organisation, Vital helped to set up three different sewing projects, within the villages of Bagira, Cidjo and Bunkivane. Each project ran for one year. On completion each participant had acquired a skill for life giving them the opportunity of earning an income of their own. Given Vital's passion for the environment and the proper use of natural resources, Congo Action joined with Vital to launch water projects that would facilitate life for the villagers, women and children in particular. PEDI identified natural springs and built proper systems of running water. Also at Vital's suggestion, we went on to finance repairs to springs that had become obsolete. (see further details on our website). Key elements of these projects were the training of villagers and organising them into committees to oversee the good care or repairs of the springs. This primary school, educating some 280 children, was built in 2007, and financed by Congo Action. It is now officially registered by the State, and at the request of the villagers, it has been placed under the umbrella of the Catholic coordination of Schools of Bukavu, South Kivu. (Abbe Mukata Bayonga Patrice). Vital provides the liaison between Kavumba school and Congo Action, by visiting the school regularly, giving advice to the teachers, and ensuring that the school educational standards are maintained. Congo Action is proud of our project achievements in the DRC, and grateful to Vital Kulimushi for sharing with us his culture, his knowledge and understanding of communities, his diligence at carrying out the work set, his advice to us, and his profound respect for the environment. Congo Action ambition is to continue supporting PEDI 's ethos & values, and to further our working partnership with Vital, with the teachers at Kavumba, the Catholic co-ordinator and all the villages committees solidly established, and looking for encouragement.